Clyde welcome league leaders Peterhead to Broadwood on Saturday for a match which could have a vital bearing on the League Two title run-in. A home win would cut the deficit between the Bully Wee and the Blue Toon to three points with four games left to play. Despite hauling themselves back into contention with four straight wins, Clyde boss Danny Lennon believes the title is still Peterhead’s to lose. He said: “We don’t break it down to being Peterhead next week, it’s the same three valuable points. 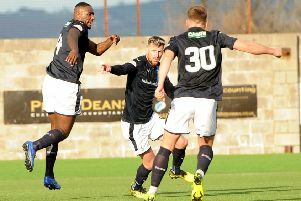 Lennon admitted his side had to dig in in difficult conditions on Saturday to beat Albion Rovers. He said: “It’s a place where you ‘ve got to come at this time of year when it’s dry and play to the conditions. “I felt in the first half we were still trying to play the football we like to go and play. But we started to adjust to the game and I felt that in the second half we looked the more likely. Defender Martin McNiff was the match winner for the second week running - but played down his own contribution. He said: “It’s all about the team performance and about winning the game and I’m just glad I can contribute because it’s getting to that stage of the season where every win is vital for us. “If I can contribute to that then great, but there’s another 10 boys on the park. The boys have got so much belief in each other.